My favorite one skein last minute gift! The Power Scarf works up quick and looks like you spent hours. 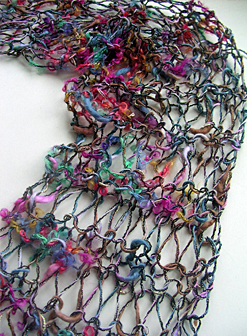 The scarf pictured uses Berroco "Optik" yarn in color "Millefleur". This scarf looks great in any worsted weight or lighter yarn, but particularly great in a variegated or ribon yarn. Detailed written instructions are included in the pattern. Stitch Techniques: E-wrap, purl, drop stitch, working as a flat panel, flat panel bind off.